All of Kanuhuru’s guest rooms are luxuriously appointed, spacious and constructed using traditional Maldivian materials: thatch, timber and stone. The king beds are handcrafted, firm and comfortable, with a dedicated pillow menu. All come with satellite TV with DVD players, broadband Internet access, and state-of-the-art espresso- and tea-making machines. Free-form baths and outdoor showers are an extra feature in all of the room types. One & Only Kanuhuru is located on one of the islands in the northeast part of Lhaviyani Atoll, Maldives in the Indian Ocean. 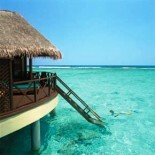 The resort is approximately 40 minutes by seaplane from the International Airport at the Maldives capital, Male'. The island measures approximately 1,000 meters long and 200 meters wide, with a north-south orientation. 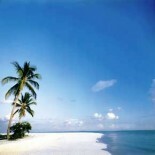 Kanuhuru is a luxury five star resort located in the northeast part of Lhaviyani Atoll, Maldives in the Indian Ocean. Kanuhuru’s stunning location and its extensive choice of amenities and activities ensure a perfect tropical vacation in some of the best accommodation in the Maldives. Kanuhuru underwent an extensive refurbishment in 2005 and just about everything was updated. The designers however were careful to preserve the resorts original charm without sacrificing any modern convenience. The wonderful rustic villas with straw - thatched roofs blend in to the tropical surrounds perfectly and create a beautiful ambiance for a romantic getaway or a fun filled family vacation. The stunning overwater bungalows enjoy a spectacular location and have been built over the top of the crystal clear lagoon while all other rooms enjoy breathtaking views of this private island paradise. The Kanuhuru experience begins with arrival to Male airport when a smiling Kanuhuru staff member greets guests and transfers them to a private sea plane for a 40 minute flight to the Lhaviyani atol . The transfer is itself a wonderful prelude to what’s in store for guests when they arrive at Kanuhuru. During the transfer guests will enjoy the breathtaking views of the tiny islands strung along the turquoise sea like a giant coral necklace. Upon arrival guests can expect a quick and courteous check in so that the pampering can begin immediately and no precious vacation time is wasted. Foodies will love the wide array of choices available at Kanuhuru. The resort offers three restaurants and a huge amount of variety. Choose between themed buffets at Thin Rah, the main restaurant, which also offers some interesting fusion dishes. The Olive Tree which specializes in Mediterranean food or the Veli Cafe for a long lunch and scrumptious Thai food in the evening. Guests can also opt to take meals on their deck or patio or to a romantic little cove, or they can order a beach barbecue. Kanuhuru is a terrific family resort and children's menus are imaginative and varied. The main bar, Handuvaru, is open throughout the day for cold drinks, cocktails and after-dinner drinks and cigars. Nashaa Club hidden at the far end of the island and open on Saturdays is the place to be if guests fancy a bit of dancing and night life. As you would expect in this stunning tropical location, Water-sports are important and Kanuhuru does not disappoint. This luxury resort has its own diving school and provides outings to some of the best dive sites in the atoll. There's also windsurfing and snorkeling, pedalos and canoes as well as tennis, squash and a golf driving range. After a relaxing day in the sun, guests may like to treat themselves at the Spa which specializes in Asian therapies—Thai, Javanese and Indian. The Spa also offers yoga and meditation. A full-service beauty salon is attached. A small conference facility is available at the Lava Lounge, which can seat up to 50 people theatre-style. A small business center is on-site. The Kids' Club, on the southern end of the island, is open until late in the evening. Teenagers have their own program of excursions, sports and discos. Kanuhuru is a great family resort, and with a staff ratio of two staff members to each guest, parents know that their young will be cared for and entertained, while they are relaxing and unwinding knowing the kids are having the time of their lives.